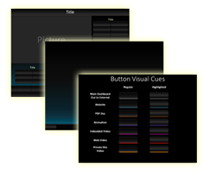 Showcase Navigation allows a speaker to move around dynamically between all slides in a single PowerPoint slide show. The movement is always a back-and-forth jump from a dashboard slide (usually the first slide in the show, but it doesn’t have to be) to a content slide. On a dashboard such as the one shown below, for example, the speaker clicks a thumbnail of choice to access that slide. When finished talking about the content, he or she then clicks that content slide itself to return to the dashboard and make another choice. 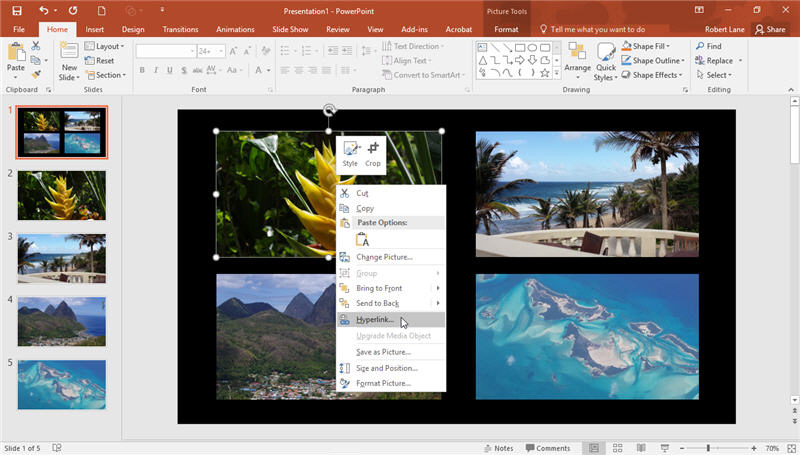 You’ll build Showcase dashboards using either PowerPoint shapes or image thumbnails (small pictures). Most feature image thumbnails, especially if the show’s content slides are highly visual. That way the speaker can easily glance through the options and receive immediate feedback on available displays. We’ll take that approach in this tutorial. This navigation style works especially well as a way of showing individual images from, say, a photo album collection of 20 to 50 images. 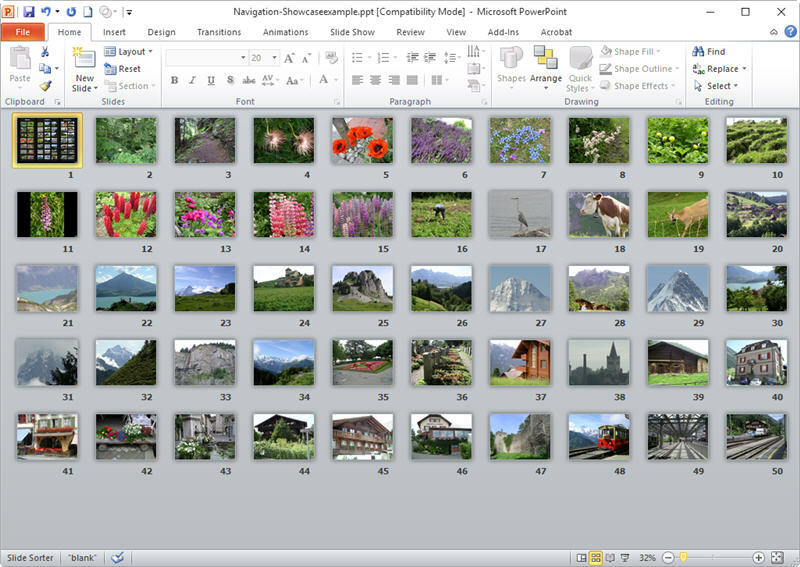 Looking at this show in Slide Sorter View, you can see it contains a total of 50 slides. All slides in the show except the first one feature a single picture, and each of those pictures covers the entire slide pane of that slide. 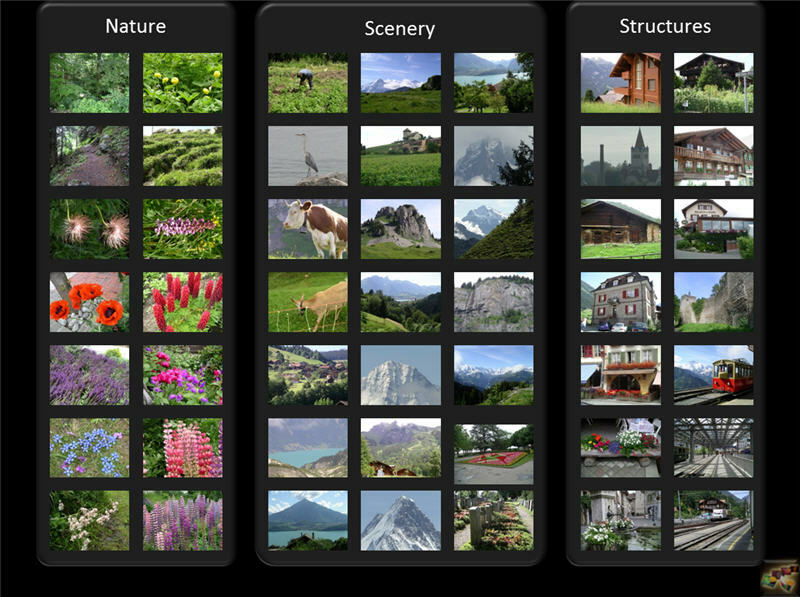 The dashboard (first slide) has those same pictures in miniature form, arranged in seven rows of seven thumbnails. In other words, you’ll always have the same number of small images on the dashboard slide as the number of big images spread throughout the content slides. Let’s build a simple example of this logic. Make a new, blank slide show and give it a total of 5 slides. The first slide will be our dashboard slide and the remaining four will hold content. For now, ignore the first slide. We’ll come back to it later. Focus on the four content slides. 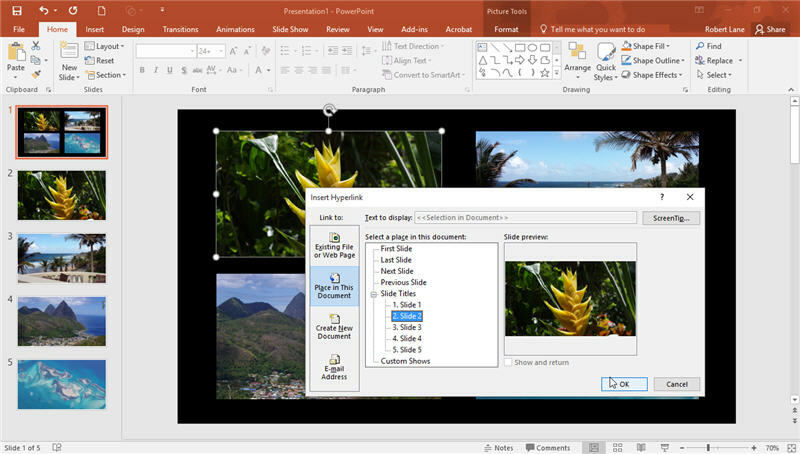 Insert a picture of choice onto slide 2 by clicking the slide 2 thumbnail to make sure that slide is selected and then clicking the Insert tab on the Ribbon and clicking the Pictures button. Navigate to where the picture exists on your computer and then either click its thumbnail and then click the Insert button, or simply double-click the image thumbnail to insert the picture in one step. The Insert Picture dialog box disappears and you should see the picture on the slide. To be consistent with this tutorial, I recommend using a picture with landscape orientation, rather than a vertical picture. Expand it’s size to cover the entire slide pane. To do so, first move the picture into the upper-left corner of the slide. Then either click the picture to select it and click and drag its bottom-right selection handle down and to the right. 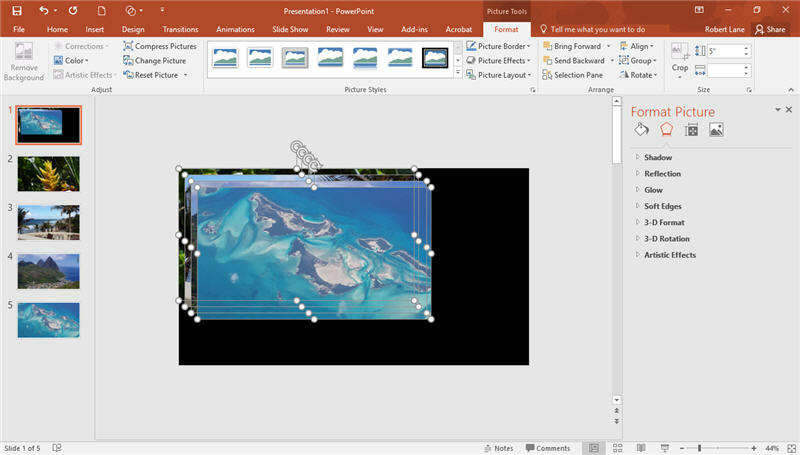 Or, with the picture selected, click the Picture Tools Format tab on the Ribbon and adjust the Size area dimensions on the far right side. 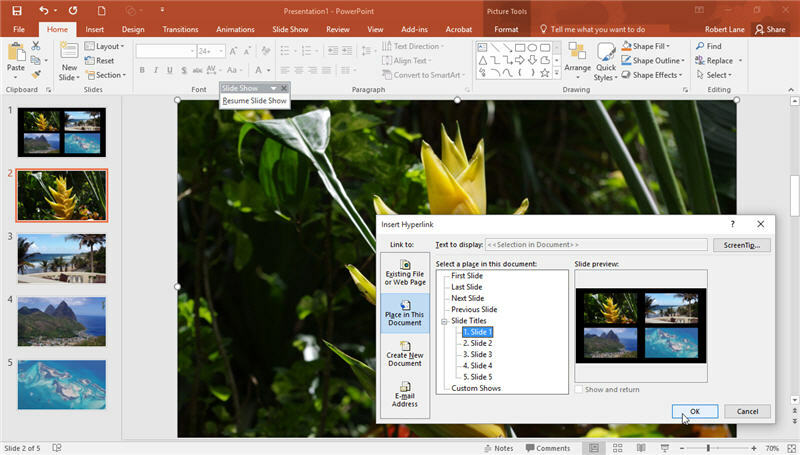 Repeat this insertion and resizing process for the remaining three content slides, using different pictures. Once the four content slides hold full-screen pictures, return to slide 1 by clicking its slide thumbnail. Here you must insert the same four pictures that grace the respective content slides. First, though, we’ll clean up this slide a bit. 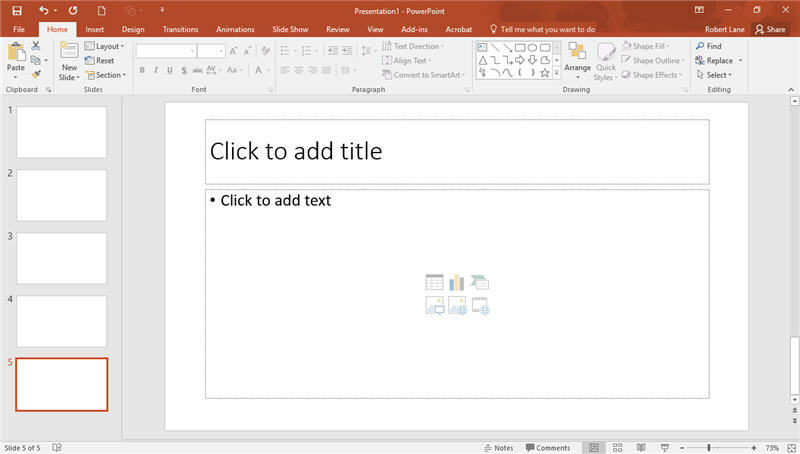 Click the border of each text placeholder box respectively and press the Delete key to get them off of the slide pane. We don’t need them. Next, we’ll make the slide’s background black. Right-click the slide 1 thumbnail and choose Format Background from the menu options. Then click the Fill Color button on the Format Background Fill panel that opens and choose black as the color. 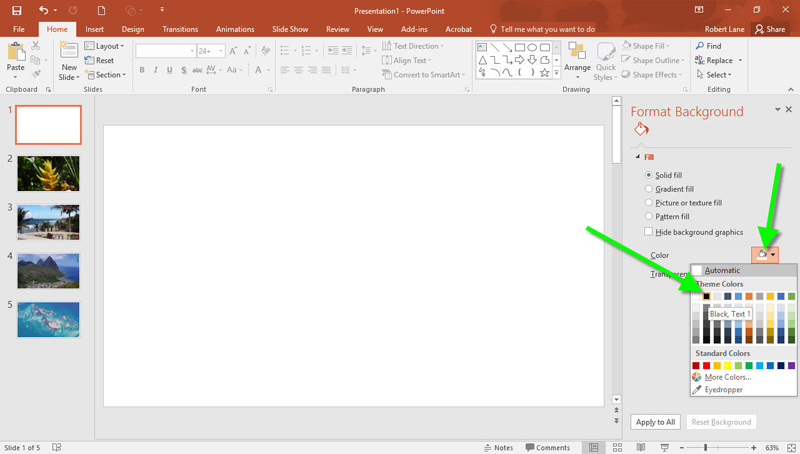 At that point you can close the Format Background panel if desired. Now we can get our link thumbnails in place. We want all four of them on this single slide. Click the Insert button on the Ribbon again if that menu isn’t already visible and click the Pictures button again. 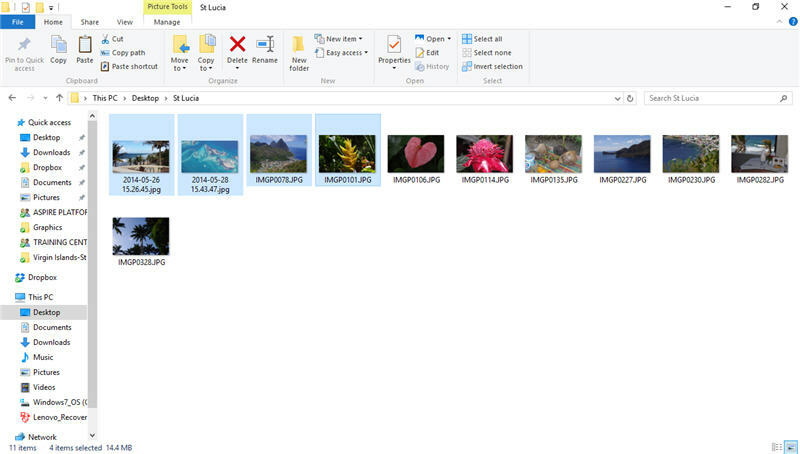 If the four pictures you inserted exist in separate folders, you’ll have to insert them here one at a time. On the other hand, if two or more exist in the same folder, save time by inserting them as a group. First select the pictures to be inserted. If the four pictures happen to be next to each other, click the first one to select it and hold down the Shift key while clicking the last one. All pictures then display selected. 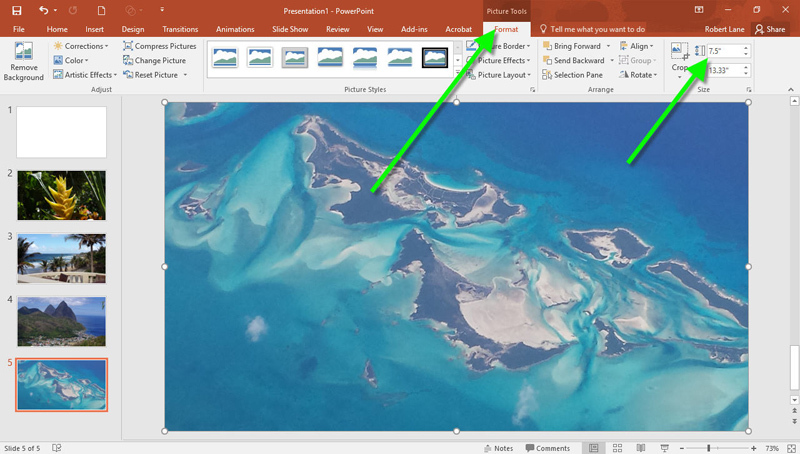 Now you can click the Insert button to insert them onto the slide. Or, if the pictures are in the same area but are not next to each other, click one to select it and while holding down the Ctrl key, click the remaining pictures to sequentially select them all. Then click the Insert button. Notice the pictures stack on top of each other, with a slight amount of offset. Now make sure all the images are selected (you should see their white selection handles at corners and sides. 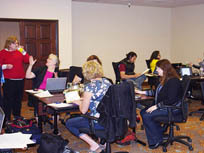 If they are not all selected, use the technique mentioned a moment ago to get them into that state. Hold down the Ctrl key while clicking each inserted picture. With all inserted pictures on slide 1 selected, click the Format Picture Tools tab again and adjust the picture heights to a desired number. I’ll leave them relatively large for this example at 3 inches high. Press the Enter key to commit the resizing change. 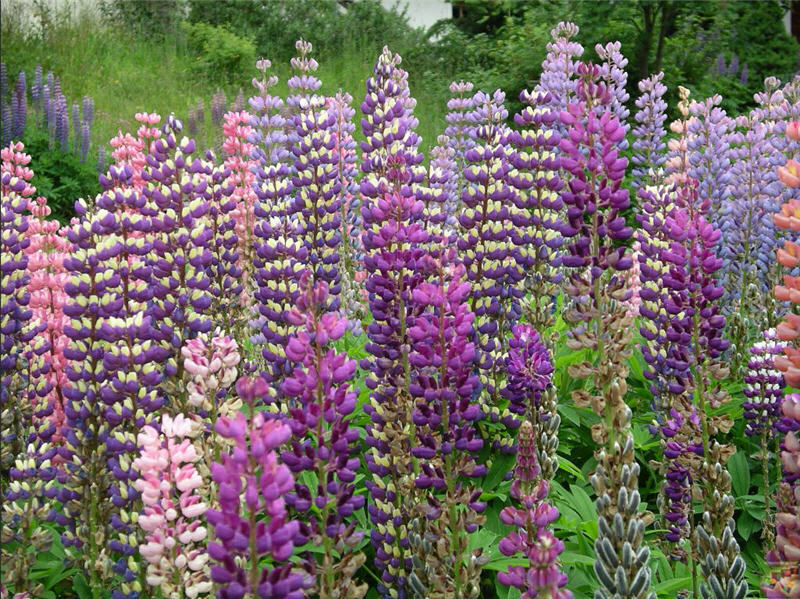 Arrange the pictures as desired. 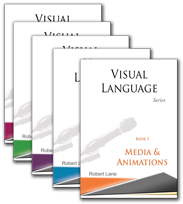 Then you are ready to add the hyperlinks pointing from these thumbnails to the slides. 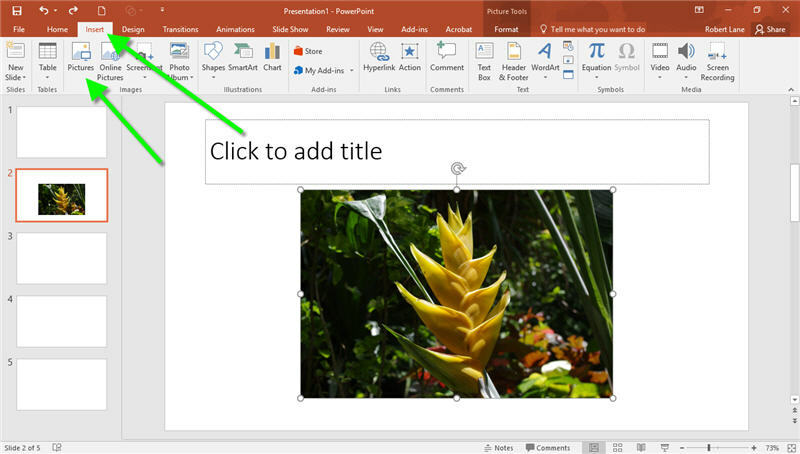 Right-click the small picture that matches the picture appearing on slide two and select Hyperlink from the menu that appears. On the Hyperlink Dialog box, click the Place in This Document tab. Then click the Slide 2 label. A preview of slide 2 appears at right. It should show the correct picture if all is good so far. Finally, click OK to close the dialog box and finalize the link. 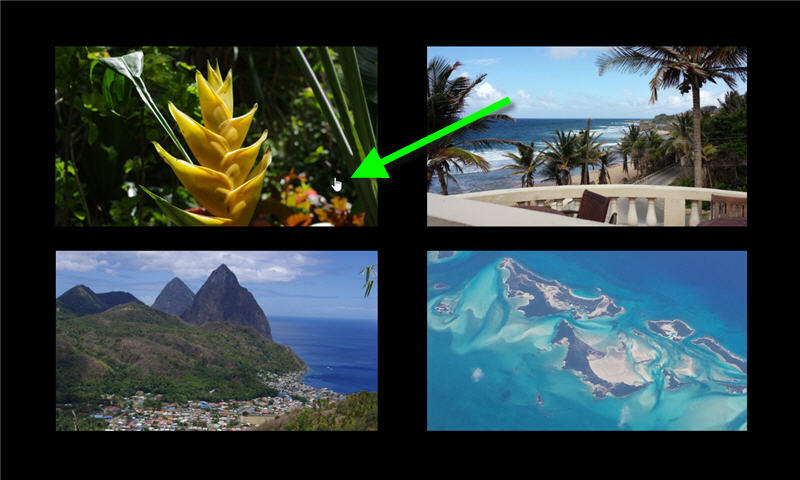 Repeat the above procedures with the other small pictures on slide 1, linking them to slides 3, 4 and 5 respectively. When finished, you have a fully working dashboard, but remember, hyperlinks only work while the slide show is running. 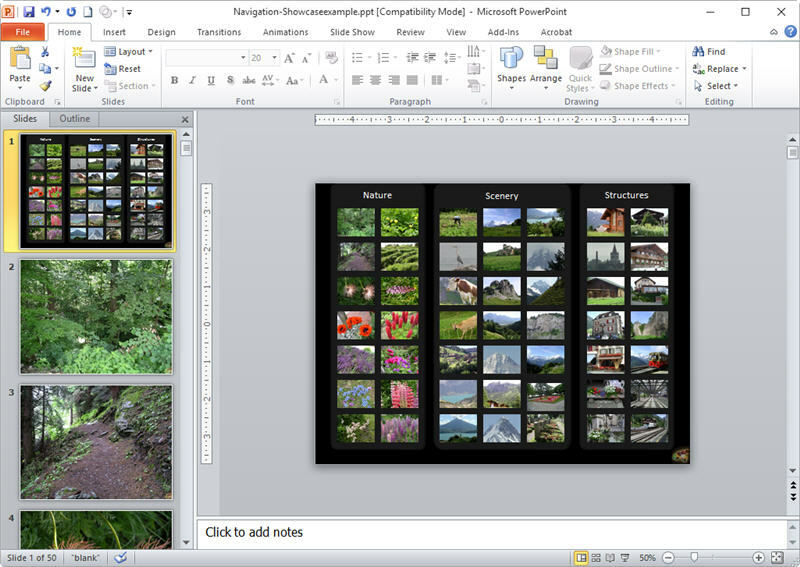 Therefore start the slide show on slide 1 and hold the cursor over any of the navigation picture thumbnails. See that the cursor changes to a pointing hand. That hand indicates an active hyperlink. Click one of the links to directly access that slide and see the picture full-screen. Once there, press the Escape key to end the slide show and return to Edit Mode. Perhaps you noticed a problem after clicking the hyperlink a moment ago. The link took you to the desired slide (hopefully, if it was set correctly) but after arriving at that slide … then what? You were stuck there. The content slide didn’t contain a similar link taking you back to the dashboard. As such, there was no way to get to another slide choice. We’ll solve this problem by linking the picture on each content slide back to slide 1. Start on slide 2. Right-click it’s full-screen picture and choose Hyperlink again. Hyperlink it to slide 1. Repeat the process with slides 3, 4 and 5. That’s it. Your navigation example is complete. Return to slide 1 and start the slide show. Now you can click any thumbnail link to reach that slide, and then click anywhere on that content slide to return to the dashboard. If all the links are working correctly, you’ll now be able to go back and forth all day long. Press the Escape key to exit the slide show when finished.